Abe was born in Southwest City, MO. He graduated salutatorian from Noel High School (1966). Abe attended the University of Missouri for undergraduate study, where he earned his degree in history (1970). He continued his education at Mizzou, graduating from the School of Law (1974). Abe has over 40 years of experience as an attorney in McDonald, Newton, Barry, Jasper, and Lawrence counties. He has served as lead counsel in dozens of jury trials and hundreds of bench (judge-decided) trials. Abe served as McDonald County Prosecuting Attorney from 1976 to 1980. 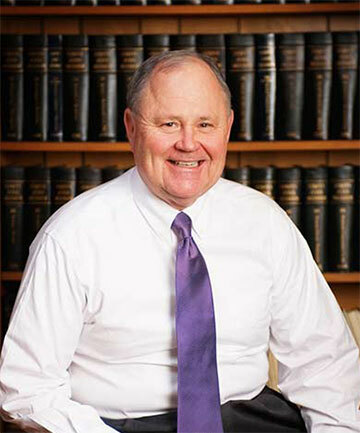 He focuses his practice on civil litigation, including personal injury, commercial litigation, and real estate disputes. Abe is one of the most accomplished trial attorneys in Southwest Missouri. Among other accolades, he has been awarded the prestigious Martindale-Hubbell AV Preeminent Peer Review Rating. Abe lives in Neosho with his wife, Nancy. He has been active in the local community throughout his life. Abe and Nancy are members of the Neosho United Methodist Church. Abe has two children, Jordan and Austin, and two step-children, Brad and Lindsay. Jordan is an attorney with the Paul Law Firm. Austin is a commercial real estate agent in Kansas City. Brad is a financial advisor with Edward Jones in Carl Junction. Lindsay is a flight attendant with Southwest Airlines in Denver. Abe is a huge fan of the Missouri Tigers. He also enjoy watching the St. Louis Cardinals, gardening, and fishing.